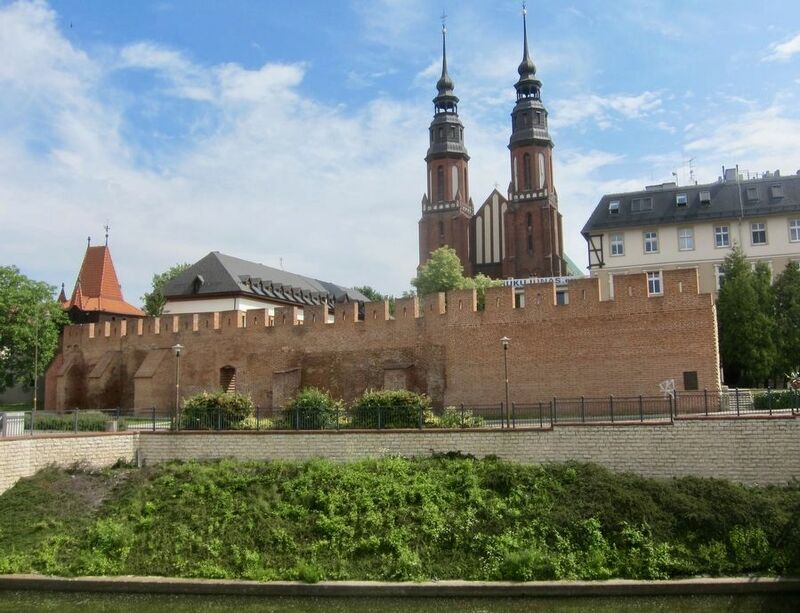 Constructed at the initiative of Prince Bolka I, in stages from the second half of the 13th Century, on top of the wooden and earthic embankments from the 10th-12th Century. The walled area enclosed 16 hectares of the medieval town location. The walls are 2.3 meters wide and 6.6 meters high, and were constructed using the opus emplectum technique. They were originally a curtain system with 5 city gates, and over time the perimeter was reinforced with 14 towers and a barbican. Thanks to these fortifications, the city has resisted enemies' invasions many times. Mur o grubości 2,3 M. i wysokości 6,6 M. Wkonano w technice opus emplectum. Był to pierwotnie układ kurtynowy z 5 bramami miejskimi, z czasem obwód murów wzmocniono 14 basztami i barbakanem. Dzięki fortyfikacjom miesjkim miasto oparło się wielokrotnie najazdom wrogów. W latach 1819-1820 zapadła decyzja o rozbiórce fortyfikacji. W 2009 r. wykonano rewaloryzację najlepiej zachowanego fragmentu muru z ukazaniem w nawierzchni jezdni ul. Katedralnej zarysu bramy miejskiej odrzanskiej zwanej też nyską. constructed using the opus emplectum technique. They were originally a curtain system with 5 city gates, and over time the perimeter was reinforced with 14 towers and a barbican. Thanks to these fortifications, the city has resisted enemies' invasions many times. 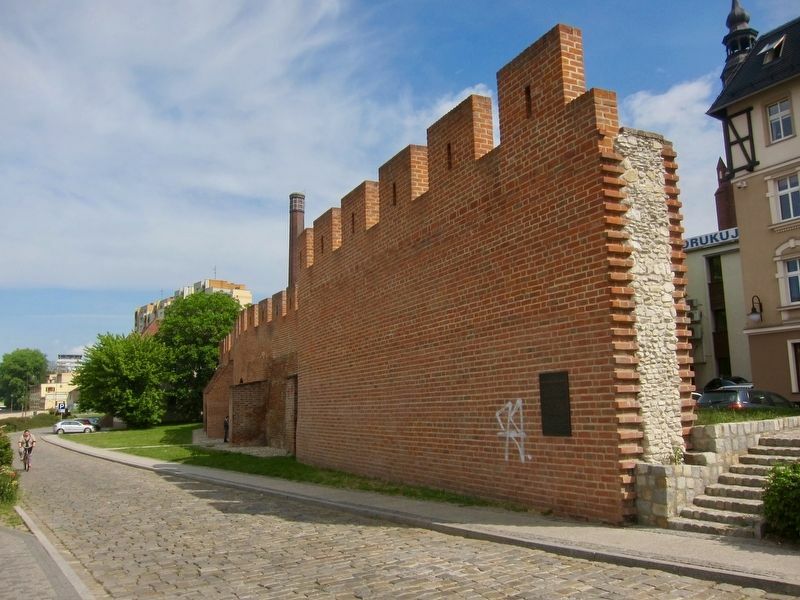 In the years 1819-1820, the decision was made to demolish the fortifications. In 2009, a restoration of the best-preserved portion of the wall was carried out, tracing the Odra River (or Nysa) city gate at ul. Katedralna (Cathedral Street, i.e. the marker site). Location. 50° 40.208′ N, 17° 55.112′ E. Marker is in Opole, Opole, in Opole Powiat. Marker is at the intersection of Księdza Stefana Baldego and Katedralna on Księdza Stefana Baldego. Touch for map. Marker is in this post office area: Opole 45-001, Poland. Touch for directions. (approx. 0.3 kilometers away); The Prince's Burgher House (approx. 0.3 kilometers away); Opole Third Reich Victims Memorial (approx. 0.4 kilometers away). Touch for a list and map of all markers in Opole. More. 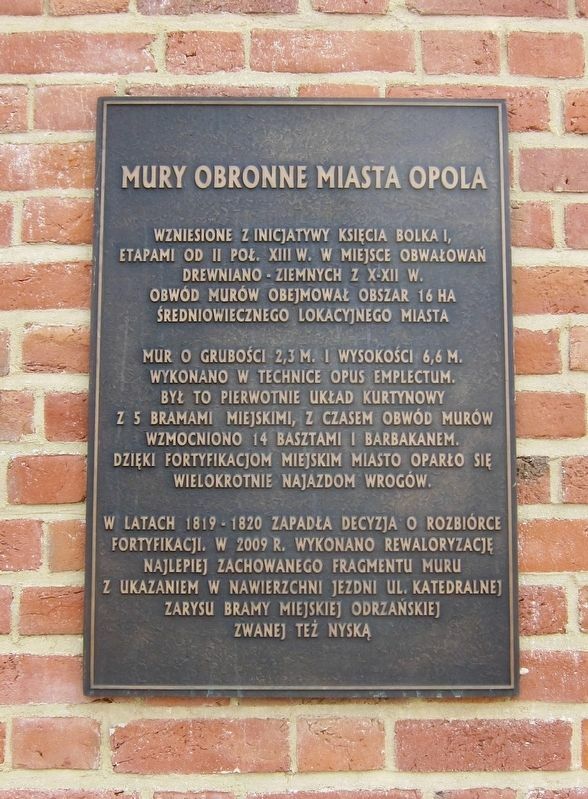 Search the internet for Mury Obronne Miasta Opola / Defensive Walls of the City of Opole. Credits. This page was last revised on June 20, 2018. This page originally submitted on June 20, 2018, by Andrew Ruppenstein of Sacramento, California. This page has been viewed 48 times since then and 4 times this year. Photos: 1, 2, 3. submitted on June 20, 2018, by Andrew Ruppenstein of Sacramento, California.